Ranked as one of the top veterinary educational programs in North America, the CVM is the one of the few to offer an onsite teaching animal unit that operates as a working farm. The goal of the Combined DVM/PhD Program is to address the critical need for veterinary researchers and academic clinicians. The Program is a multi-disciplinary, multi-College program that will provide the clinical and research training and financial support necessary to produce the leaders of the next generation of veterinary clinician scientists. The focus of the program is flexibility and integration, emphasizing seamless transition between the veterinary school and graduate school while promoting integration between the two curricula. The Combined DVM/PhD accepts students to the Comparative Biomedical Sciences where they study with faculty who are employing state-of-the-art techniques to address a number of interesting scientific problems in the basic and applied biomedical sciences. College of Veterinary Medicine emphasizes basic and clinical research using an array of in vitro approaches and animal models of veterinary and human disease. The research environment relies on collaborations between clinician scientists and basic scientists. This team approach will include outstanding individuals selected to join our Combined DVM/PhD Program, producing researchers destined to expand the frontiers of veterinary and human medicine. North Carolina State University is a leading research institution with particular strengths biomedical research and veterinary medicine. The College of Veterinary Medicine is one of the top 5 Veterinary Schools in the nation, in part because of the quality of the research programs at the college. Faculty at the College of Veterinary Medicine participate in the Comparative Biomedical Sciences graduate program. The College is also home to the Comparative Medicine Institute. 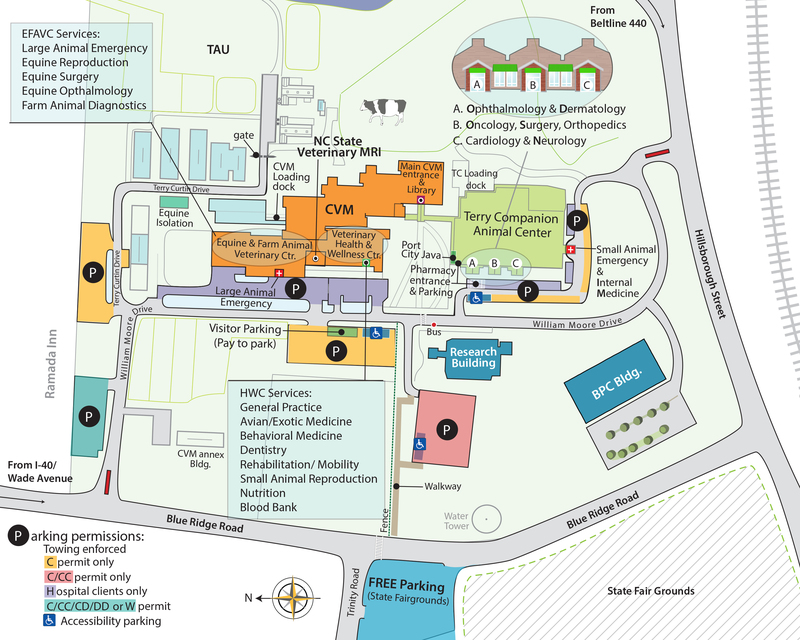 The College of Veterinary Medicine anchors the Centennial Biomedical Campus, part of the North Carolina State University Centennial Campus consisting of multi-disciplinary R&D neighborhoods, with university, corporate, and government facilities intertwined. The Centennial Biomedical Campus neighborhood focuses on biomedical applications, both to animals and human. North Carolina State University is strategically located within a 20 miles radius of the University of North Carolina-Chapel Hill and Duke University, homes to two premier medical schools, and the Research Triangle Park, home to the National Institute of Environmental Health Sciences, Hamner Institute for Health Sciences, and the Environmental Protection Agency RTP campus. The research Triangle is also home to many biomedical companies forming one of the hottest biomedical research regions in the United States. The College of Veterinary Medicine has numerous collaborations with these agencies and universities from which multi-institutional research projects arise and from which to draw world-renowned scientists and students to participate in Combined Degree Program activities and seminars. The Curriculum for the DVM and graduate programs will be integrated as much as possible for individual students. The timeline outlined below is a template that we expect most students to follow. The timeline can be modified to best suit the student’s needs, with approval of the Director of the Combined DVM/PhD Program, the Director of the CBS Graduate Program, Associate Dean of Academic Affairs, Associate Dean of Research and Graduate Studies, and the student’s major advisor(s). We expect most students to complete the program in 7-8 years, but this may vary depending on circumstances. Students will enter Year 1 in graduate school to begin taking graduate courses, complete laboratory rotations (2-3), and choose a thesis lab. In Year 2, students will enter the DVM program and complete the first year of the DVM curriculum. The summer after Year 2 will be spent in their thesis lab doing research in the Interdisciplinary Biomedical Research (T35) training program. In Year 3, students will complete the second year of the DVM curriculum. In Year 4, the student will re-enter graduate school to finish graduate school classwork and to complete their thesis research. The final 2 years of the DVM curriculum will be completed once the student has defended his or her thesis. Students may re-enter the DVM curriculum before the final oral examination for the PhD (thesis defense) as long as the thesis dissertation is written and submitted to the Graduate Advisory Committee and the final oral examination is scheduled. The Comparative Biomedical Sciences (CBS) graduate program in the PhD home for Combined DVM/PhD students. The CBS program consists of seven concentration areas, Cell Biology, Neurosciences, Immunology, Infectious Diseases, Pharmacology, Pathology, and Population Medicine. The College of Veterinary Medicine has created a Clinician Scientist Focus Area to provide veterinary students with research opportunities that combine clinical and basic science. This focus area allows students time to do significant research during the DVM. The students in the DVM/PhD program will be encouraged to choose this focus area to allow more time for research and graduate school coursework during the DVM curriculum. However, students may choose any focus area. Students will have two assigned mentors, a clinician in the area of clinical interest and the major graduate advisor (these duties may end up assigned to the same mentor). The Director of the Combined DVM/PhD Program will also serve as a mentor to ensure that the student makes good choices and navigates the combined program efficiently and productively. Students are required to complete all of the requirements for the Comparative Biomedical Sciences graduate program. Students are required to participate in the Comparative Medicine and Translational Research journal club each year they are in the PhD phase of the program. This journal club is for DVM/PhD program students to discuss clinical and scientific aspects of health problems in animals and humans, and to discuss current scientific literature that use translational approaches to solve these problems. Students are expected to apply for and participate in the Interdisciplinary Biomedical Research training program under the guidance of their thesis advisor during the summer between years 1 and 2 of the DVM curriculum. Students are required to attend the National Veterinary Scholars Symposium at the end of this summer and participate in the DVM/PhD program colloquium at this event. Students are expected to present their research at the CVM research forum. Students are required to attend one national or international scientific meeting to present their research. A number of social events will enable students to keep in contact with veterinary students and graduate students in other programs, maintaining a tight knit student community. Complete the electronic application for veterinary students available through Veterinary Medical College Application Service (VMCAS). The deadline for the VMCAS application is September 15. Describe your areas of interest in the medical sciences and how your research experiences contributed to their development. What are your long-term career objectives in the veterinary field and how you plan to achieve them. Explain how the Combined DVM/PhD Program will contribute to achieving your goals. Describe the role you envision for research in your career. ***Please note that these supplemental application questions are in addition to the regulate DVM program supplemental application questions. All questions must be answered to complete your application for the Combined DVM/PhD program. The supplemental application is submitted online through the NC State CVM website. Students are required to submit an application for the CBS graduate program once offered admission to the combined DVM/PhD program. Application materials and instructions for all graduate programs are located at the Graduate School webpage. The graduate school application will appear redundant, but must be completed to be admitted to the graduate program. Transcripts and letters of reference, for example, must be submitted with each application. The Graduate Program Coordinator will assist students with the graduate school application. The Combined DVM/PhD Program is seeking outstanding individuals with a commitment to a career in veterinary or biomedical research. These individuals will have strong academic records, excellent GRE scores, and significant research experience. The research experience should be emphasized in the letter of intent, supplemental application, and the letters of reference. Only US citizens and permanent residents are eligible.